Anyone visiting Leicester knows you are spoilt for choice when it comes to Indian restaurants, but this is the jewel in the crown. 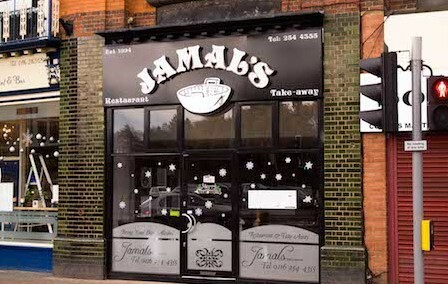 Jamal’s is a small, family run business: mum, dad and son all take pride in creating a cosy atmosphere and offering high quality food at incredibly reasonable prices. Take your own alcohol and your ideas about what you would like to eat and talk to Jamal or Sarah, who will amaze with you piping hot, delicious, non-greasy Indian food. The naan breads are the best ever and I guarantee you will return here time and time again. Do not be put off by the location which is at a busy junction at the bottom of the Hinckley Road. Once inside you are in a different world of fresh spices cooked with care. This is Leicester cuisine at its best. Not surprisingly you need to book.